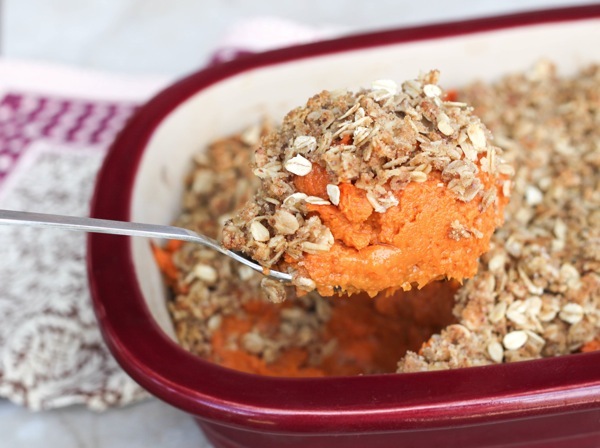 Here’s the sweet potato casserole you need at your Thanksgiving table. Livi and I were planning on going to squadron Thanksgiving on Friday afternoon. She ended up being awake all night Thursday night -teething is the worst- so after playing with friends Friday morning, we came home for naptime. Since she didn’t sleep well the night before, she napped until 5:30! We ended up missing squadron Thanksgiving (which started at 5)… there was no way I was waking her up. So, we had 15 baked sweet potatoes that weren’t about to go to waste. 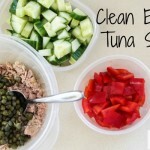 This is another one of my favorite clean Thanksgiving recipes. I don’t mean “clean” in the sense that it’s devoid of butter and loaded with Stevia, but rather a lighter option than the usual fare, using all homemade ingredients. 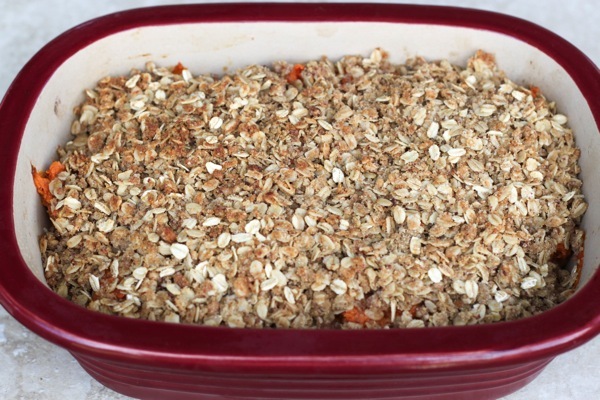 Sweet potato casserole is one of my all-time favorite Thanksgiving foods. Ok, so I love all Thanksgiving food, but this casserole always has a special place in my heart… and the largest dedicated plate space 😉 Even though I do like the ones with the marshmallow topping, I really love this crumble variation. The crumble adds a nice complementary texture to the creamy taters. You could also add some dried cranberries or mini marshmallows for a festive flair. A gluten-free variation of a beloved holiday favorite. Feel free to add in some dried cranberries or mini marshmallows, too! 1. Preheat the oven to 400. Wash the sweet potatoes, poke them each a few times with a fork, and bake on a cookie sheet for an hour until soft. 2. Let the potatoes cool slightly, peel them, and place in a mixer, along with the butter, vanilla, milk, sugar, salt and vanilla. 3. Mix well until smooth. 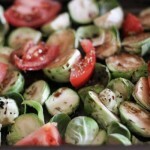 Spread the potatoes evenly in a deep baking dish or casserole dish. 4. Prepare the crumble mixture in a separate bowl by mixing all of the ingredients. 5. 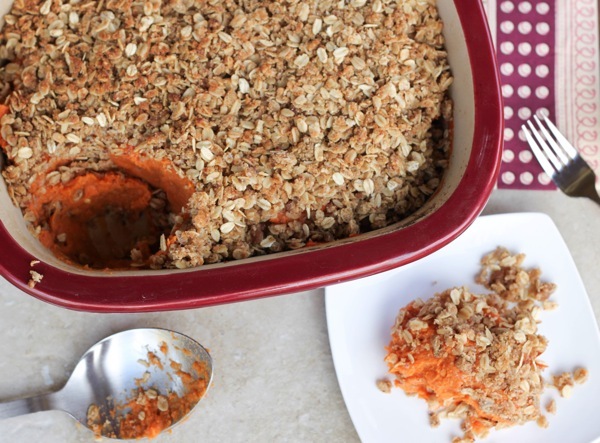 Top the sweet potatoes with the crumble mixture, and bake for 35 minutes. Feel free to use any butter or sugar substitutes that you love. 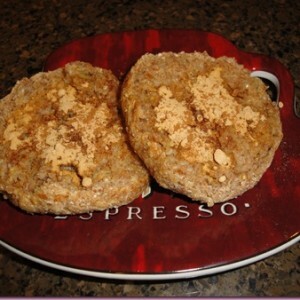 Coconut sugar and Sucanat both work well instead of brown sugar. Are you cooking for Thanksgiving this year? What are you making? We’re doing the usual lunch/dinner with my dadoo’s side of the family, then everyone is coming over here for nighttime dessert party. I’m thinking of making peppermint brownies, slow cookie hot cocoa, white chocolate cranberry cookies, and buying pumpkin pie from Costco (<– the best). As far as the weekly meal plan goes, we’re keeping it pretty simple this week. I’ll chop veggies to have on hand for salads, make some cranberry amazeballs (obsessed with these right now) and make simple dinners leading up to the holiday. YUM! 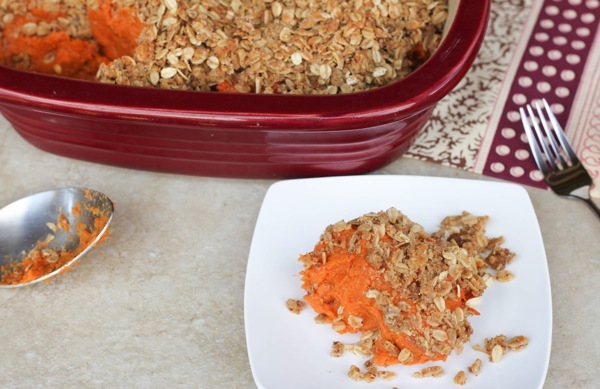 I’ve actually never had a sweet potato casserole before (GASP! ), but now am definitely interested in trying this one out! It looks soo delish and very healthy! PS – I love your shopping as a workout plan on Friday 😉 sing it, sister! i don’t think i’ve ever had sweet potato pie! “I don’t mean “clean” in the sense that it’s devoid of butter and loaded with Stevia.” Hahahaha, that was great. Makes one’s current definition of “clean” seem pretty warped. I’m sure in no time we’ll find something “harmful” about stevia, but (praise the lords!) there will be a new sweetener to take its place. Even though I sometimes use stevia, it can freak me out a bit. I feel like a creepo when I take out my little dropper bottle and am so intent on only TWO drops in my tea! I’m sure people who don’t know what it is think i’m puttin’ a little extra sumthin’ sumthin’ in there, haha. I’m making tons of sweet potato stuff this year! 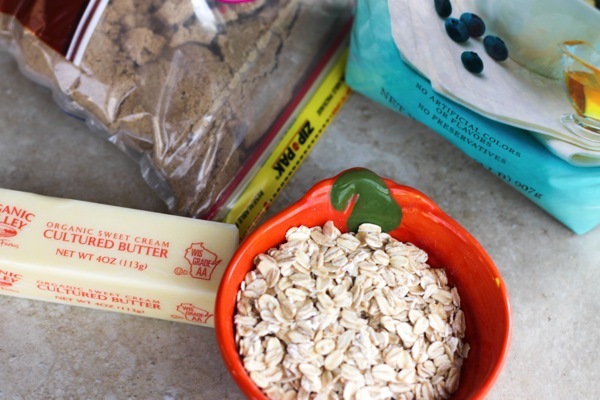 I always make a maple pecan sweet potato casserole for my fiance’s family and my family wants a “healthier” option, so I’m using light coconut milk and making the topping with pecans, chia seeds, a little coconut palm sugar, and oats. Should be delicious. If I have leftovers sweet pots, I also found a recipe for roasted sweet potato cheesecake. Holy yum! Looks fantastic! How much vanilla is in with the potatoes? It is listed in the instructions (twice, actually), but not in the sweet potato ingredient list. Thanks! I love the idea of a night time dessert party! We are going to be away from our family unfortunately this year so I am just going to be cooking for the husband and I. It should be low key BUT I am looking forward to trying out some new healthier Thanksgiving recipes. This looks so good! And I love the idea of a crumble topping instead of the typical marshmallow — much more appealing to me! Totally agree on the crumble option!! i can’t say i’ve ever tried sweet potato casserole, but i LOVE sweet potatoes in general and this recipe looks absolutely delicious! to be honest, i only love sweet potatoes plain! but i LOVE them! grill them plain, no sugar butter or oil needed, so my mom saves some for me over thanksgiving 🙂 we do make some with orange zest & juice though, and its pretty good! Yum!! I love sweet potatoes! 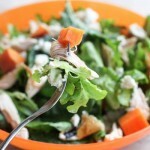 This looks so good and much healthier than our usual sweet potato with marshmallow dish on Thanksgiving. I’ll have to give this one a try. Thanks for sharing! Do you think I could do Soli Beat even if I’m pretty uncoordinated? 🙂 I’d really love to try it but I’ve always had problems with dance style DVDs because they go so fast and I can’t keep up! I don’t have much of a dance background and it feels like a lot of the ones I’ve tried are geared towards dancers even though they say they aren’t. I love this recipe though! Sounds great! Oh me too. Two left feet and no sense of rhythm. Someone needs to answer this question! Thanks Gina! I’m really glad to hear that because I really want to try your DVD! omg this is awesome! I love sweet potato casserole! Pinning! I’m responsible for the sweet potato casserole this year too! I love it so much. Not the marshmallow kind, though. Mine is topped with pecans! I’ll probably be posting it on my blog in the near future. I can’t wait for the new video!!! 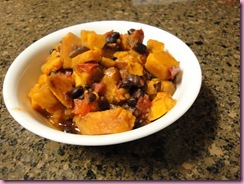 This sweet potato dish sounds amazing! I’m planning to make it for Thanksgiving tomorrow. The sweet potatoes we usually get at the store are really big so 12-15 sounds like a lot – any chance you know the approximate weight for the potatoes you used? Hi Gina! This looks delicious! 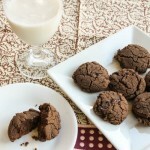 Instead of using almond meal (allergy reasons), could I substitute whole wheat flour? Would it be the same measurements? Thanks! Do you think this is freezable? And if so, would you make the casserole part and the crumble part separate and freeze them separate, then combine them to bake? yes that sounds like a perfect plan!! 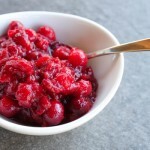 Mm, I can’t wait to try making cranberry amazeballs!